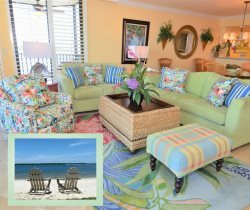 Whether you want to golf on an island with a picturesque backdrop of sand and blue ocean waters, or prefer a country club atmosphere with plenty of greenery and sparkling lakes, there are plenty of opportunities at the Sanibel golf courses and tennis resorts near Fort Myers, FL when you book your stay at one of our South Florida rentals! Simply choose from one of our recommendations below for the best golf courses near Sanibel Harbour. The Dunes is an 18-hole award-winning course designed by PGA Tour Winner, Mark McCumber, within a beautiful wildlife preserve. It was recently voted the "Best Golf Course in Lee County" by Gulfshore Magazine. The Dunes course offers breathtaking views and is challenging for all skill levels. If you are traveling without your clubs, the Dunes full-service pro-shop offers Callaway club rentals for men and women. Multiple-day package deals are also available. If you`re more of a tennis player than a golfer, don`t worry, you too can enjoy the beauty of The Dunes. For more information, check out The Dunes Golf & Tennis Club. This semi-private, 18-hole, Par 70 championship golf course wrapped around the scenic beauty of the Sanibel River offers an unforgettable golf experience for players of all skill levels. The Sanibel Island Golf Club course will test your accuracy with the fairways, water hazards, and sand traps - everything you need for a challenge and to improve your game. After your day on the course, the Blue Coyote Supper Club has great food and drinks. Open to the public! The Shell Point Golf Course is located 1/2 mile from Sanibel! It`s an 18-Hole course designed by Gordon Lewis, architect of some of the finest golf courses in Florida! The Shell Point Golf Club has challenging fairways, winding water hazards, and six tees on every hole. It provides challenges for golfers at every skill level. The Fort Myers Country Club has an 18-hole course located on the historic palm tree-lined McGregor Boulevard in the heart of Fort Myers. Designed by the great Donald Ross in 1916 and opened in 1917, it is one of the oldest facilities on the west coast of Florida! Tee time reservations can be made online up to 7 days in advance or via telephone 1 day in advance. The Eagle Ridge Golf Club is both challenging and enjoyable. It presents a 6,500-yard championship layout framed by native pine and cypress trees. Water comes into play on 17 of 18 holes, making it challenging for golfers at every level. There is quality food and beverage services as well.